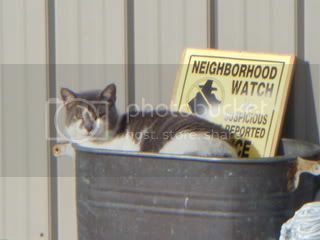 Hacker, the cat, is the neighborhood watch lately. I've been so busy with getting my hair cut, having another garage sale, working three jobs and getting ready for Isla that the cat thought he better keep an eye on the homestead. Sorry to everyone for not faithfully reading or writing blogs lately. Hopefully things will slow down a bit next week and I can start packing for Isla. As Hacker watches over the outside. Angel, the dog, sits in our closet and sulks!! She has decided that Biggy B's clothes make a great dog bed. That will teach him for leaving them on the floor. She is use to mom being home all day or taking her on walks and car rides. Next week my Angel!! Brenda -- I have noticed that Jiggs has started sleeping in more sheltered areas in the house while I am gone. I wonder if they do that as they age? So how did the hair appointment go? I remember you posting about what color you should go. Will we get pictures?? Isn't it interesting how "life" intrudes to the point of distractoin some times? Steve...I think you are right. Angel is only 3, but she has just started doing this. 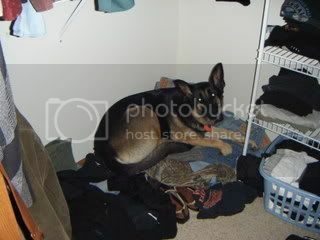 Our other Shephard, Cleo (Rest her soul), use to sleep in the closet all the time. Especially during a thunderstorm. Deb...Hair appointment went great. Had about 4 inches cut off, layers put back in and kept the darker brownish/red color. I'll have to get some good pics. Babs..Life is definatly distracting me from my blogs right now. I worked until 2am this morning and have to be back at work at 11am this morning. And that is only my "real job." That is a great composition of Hacker sitting in the bucket. Jackie...I was backing out of the garage to leave for town and spotted Hacker sitting there. I have learned to carry my camera with me and took the shot.